Mary Lynn Allemand was from Carencro, Louisiana. Her parents were Clay and Claudia Keddy. 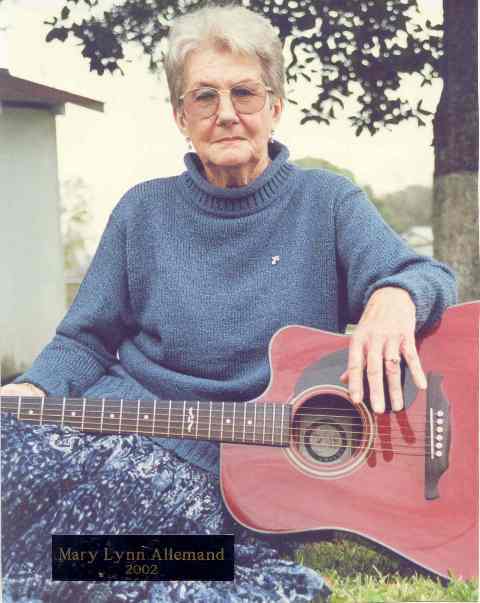 Mary Lynn was inducted in the Cajun Lady Musician’s “Wall of Fame” January 20th 2002. She passed away July 23, 2003. She has received Certificates of Appreciations from several nursing homes for entertaining and for her charitable giving of her time and talent. Mary played at jam sessions also. Quote from Mary Lynn’s bio; "I started playing Cajun music with Cliff Robin when I joined his Cajun band. I had been playing guitar and singing Country & Western before that. At one time Cajun bands weren’t as popular as they are now. I play the guitar, and I wrote one gospel song. My favorite Cajun music experience was playing with Cliff Robin’s band." Cliff was the one who influenced her to play Cajun music. Aside from playing Cajun, she loved to play her piano. Mary Lynn loved playing in the nursing homes especially because it took away the loneliness from the elders even for a short while when her and Cliff’s group was playing. Every one loved her singing. Cliff was the fiddler and band owner.